Over the course of the last few months I’ve discovered my love for Crystals and Gemstones. 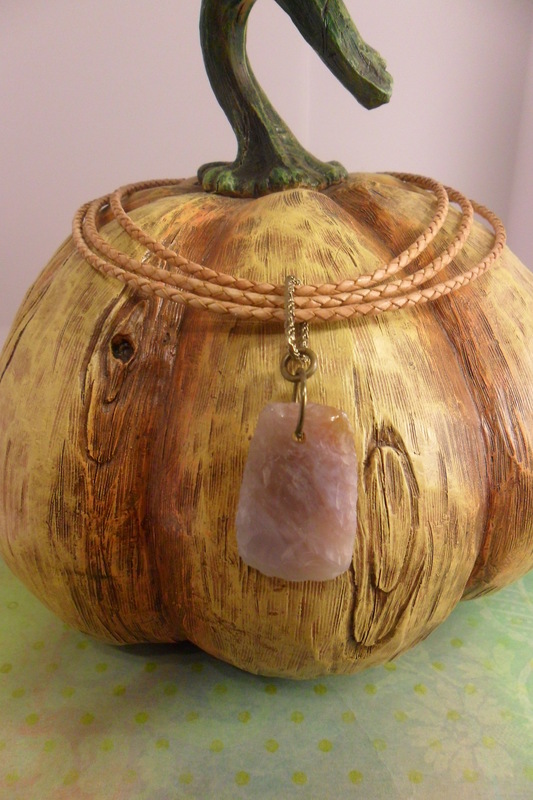 I always used glass beads in my creations – and I still do – but natural stones are definitely taking over. It started slow – a quartz pendant here, a few amethysts there, and now most of my necklaces are exclusively made of stones. Of course I wanted to know more about them, not just be like ‘oohh, that’s pretty…love the color’. While the color does play a big part in my designs, I’d like to be able to tell you about their symbolism, healing properties, and what each stone can do for you! That’s how I came to making ‘Chakra’ Necklaces. You’ve heard of Chakra stones, and their ability to balance your life-force energies. You probably know the Yoga/Chakra therapy as meditating with the corresponding crystals on each point – at least that’s how I knew it. Now, I don’t want you to roll around on your necklace – though you can if you so desire…it’s all about relaxing and being happy! 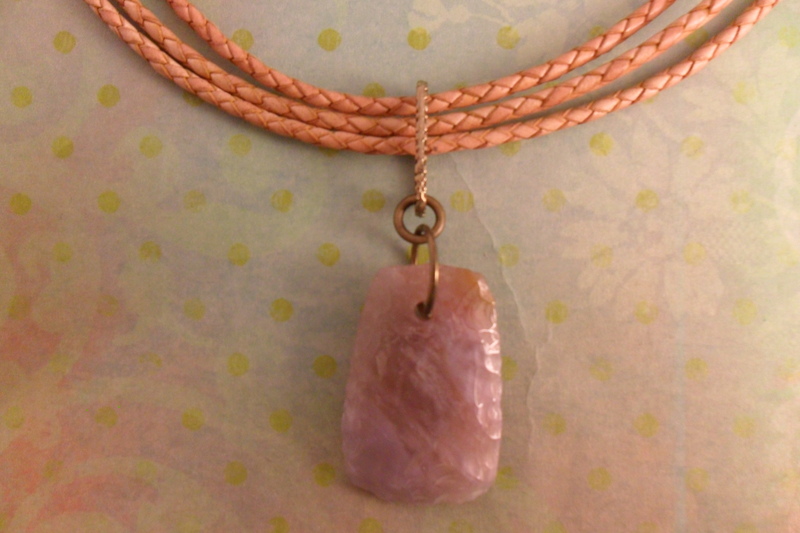 – I learned that the crystals incorporated in jewelry can also help you activate and balance individual chakras. This is just basic information, the tip of the iceberg – if you would like to learn more about the history and tools of Chakra healing (there are so many more helpful aides out there) you may want to consider getting the ‘Chakra Bible’ by Patricia Mercier (not affiliated) I found that to be the most helpful book out there. Well, just between you and me, this was going to be a newsletter – but apparently I got a little carried away, and this turned out to be longer than intended. So…I leave the rest of my list ’til next time! Hellooooo ~ Monday again….and the end of August already – can you believe it?! I hope you had a great summer! Are you looking forward to autumn? I sure do – I love the cool, crisp mornings, the color palette, the clothes, and, of course, my boots! 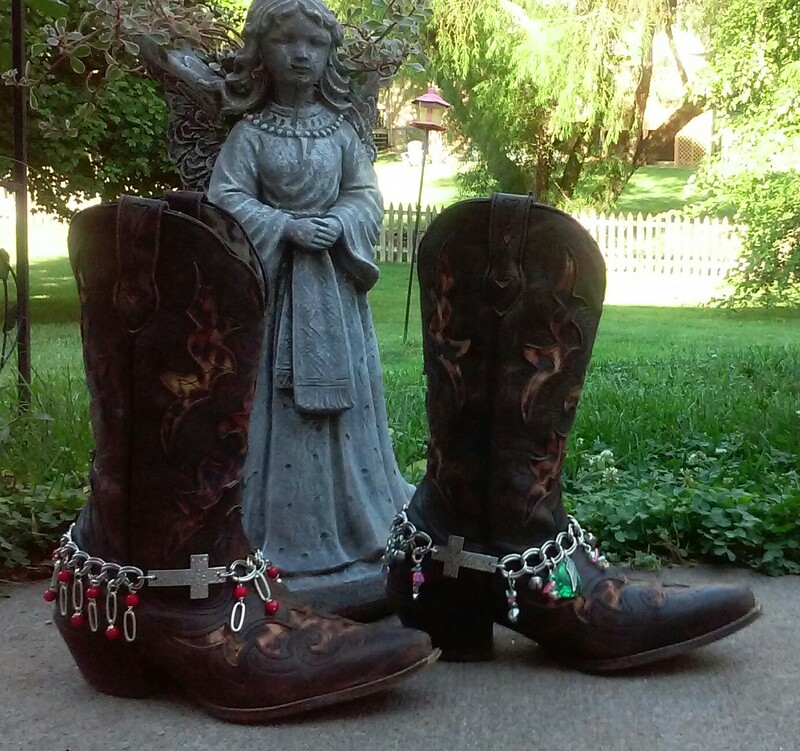 Can’t wait for boot-weather! 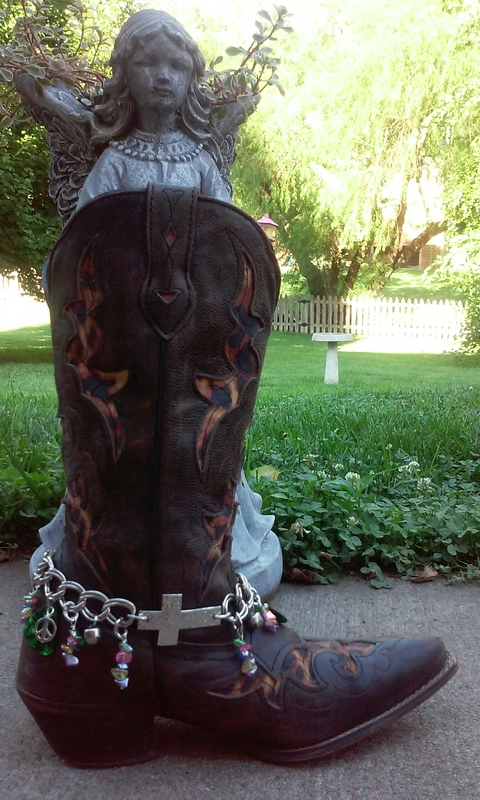 😀 Have you seen the fun boot accessories I started making last year? Those were a big hit at the store, so for this year I made more! 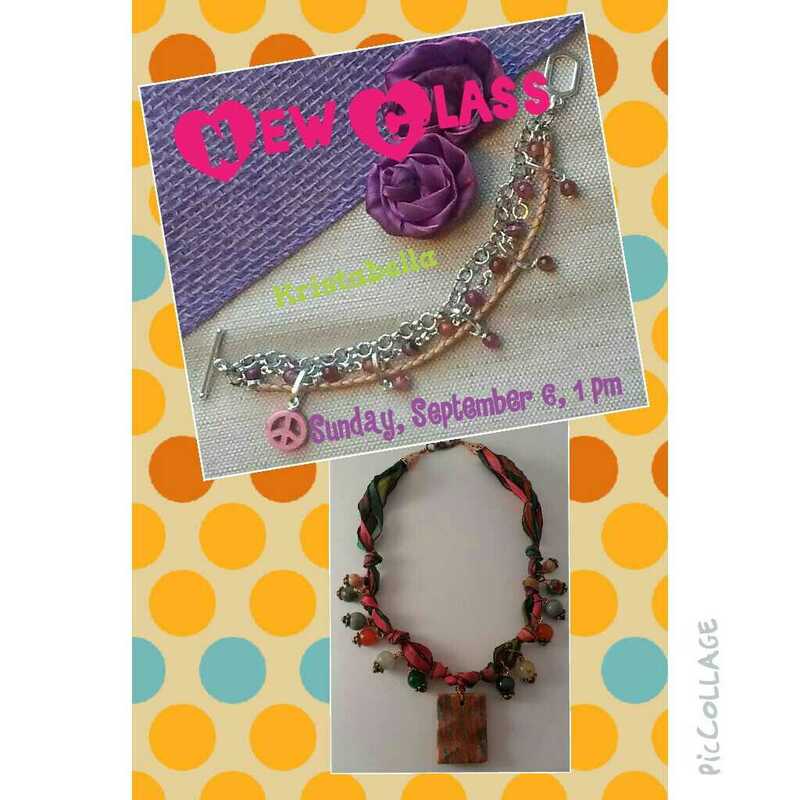 Take a look …. As you know, I’ve been working on the store expansion over the last few months. The flooding we had set us back a bit, so this has been taking longer than anticipated. But, it’s all finished now! Yay! This week I added the last touch (well, for now). Wait…I’m getting to the new deco…gotta set the stage…. 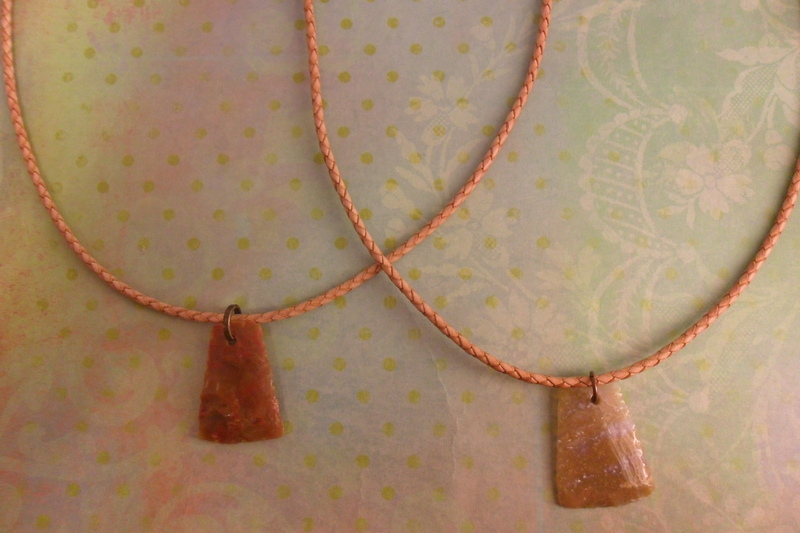 Remember last week I had started weaving pendants for the new Fall-Line?! Well, I’m happy to report that the first pendant is finished, off the loom, and made into a necklace. The pendant is attached to a safety pin ~ I love working with safety pins, they give everything a slightly edgy look, without overpowering, taking over the design. 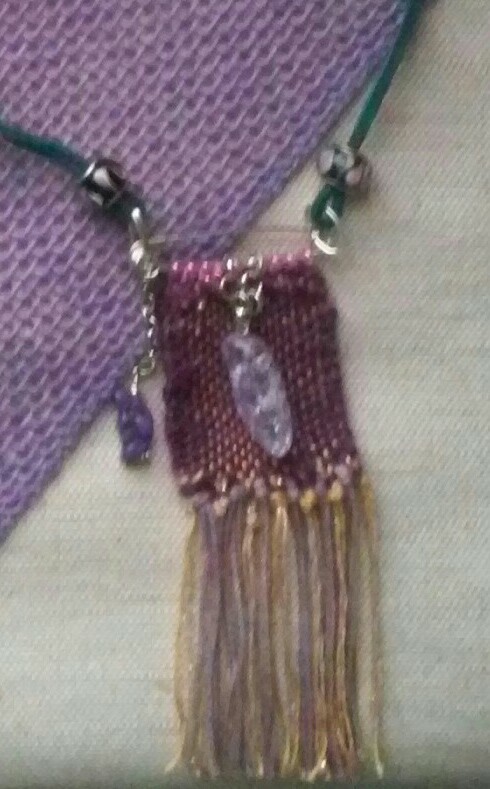 The Quartz crystal is dyed a light purple. 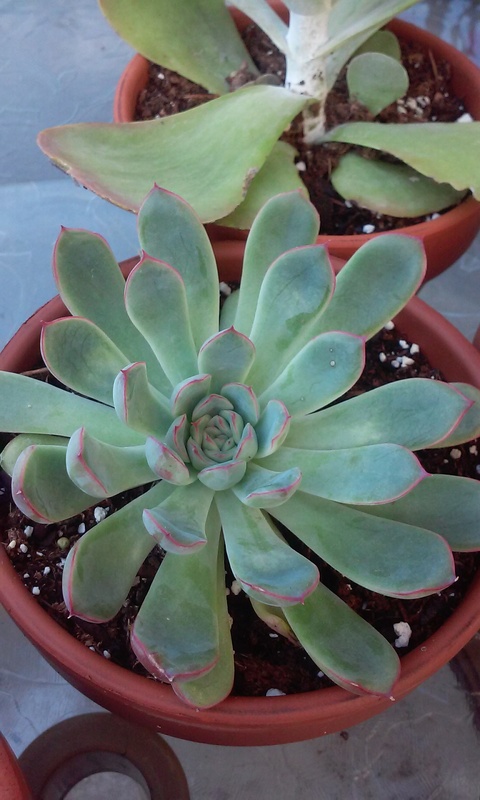 I do believe I will be making more of these pretties! What do you think? You like? Hello all ~ It is Monday! Do you dread it, or do you look forward to it? I personally love it, because I’m in the shop on weekends…so Monday is my ‘your Saturday’. So…Monday, new week, new possibilities – I thought I try on something new for size. A newsletter! Let’s hope I have enough news to fill this page, to keep you entertained! 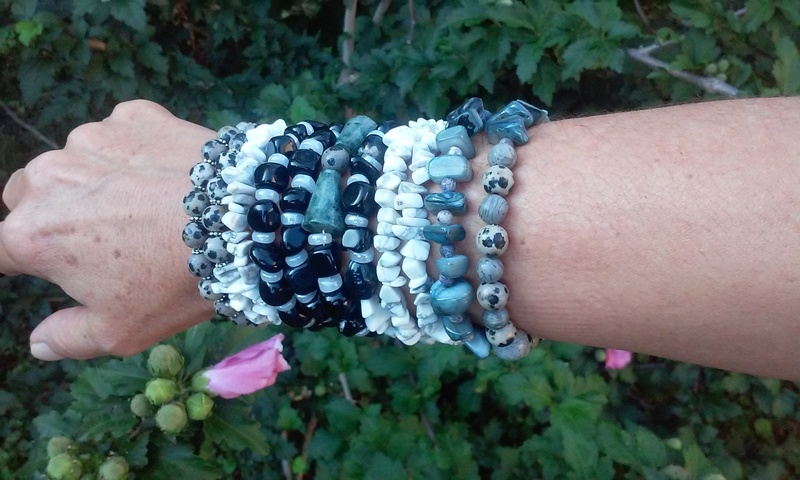 The beads are – white/grey Howlite chips, Agate, Marble cones, dalmatian Jasper, Mother-of-Pearl and Czech glass discs. 2. 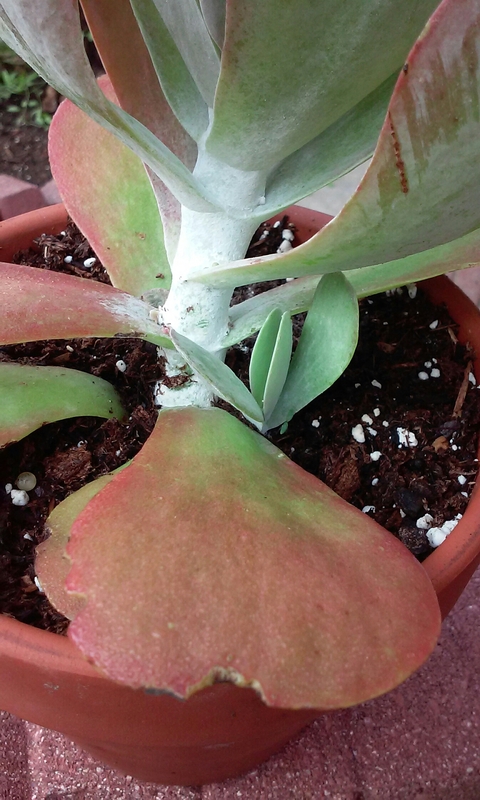 I replanted my succulents – those poor things were really suffocating in their little plastic pots they came in. 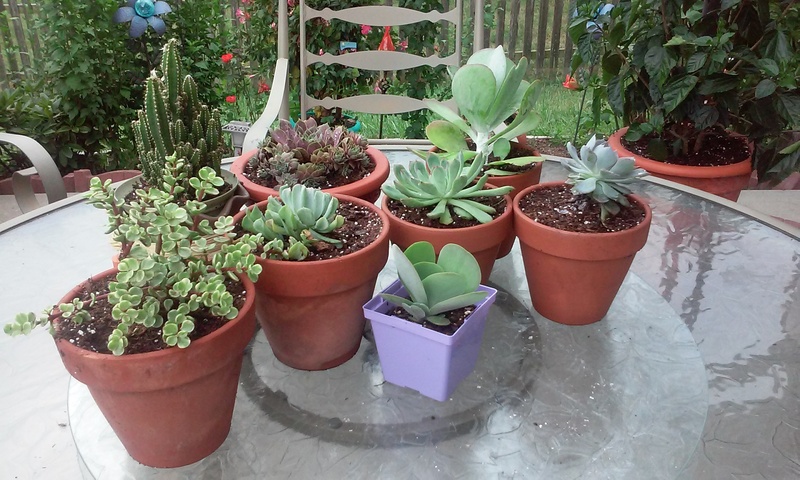 Now they’re enjoying the beautiful (almost fall-like) days grouped on the patio table….and I enjoy them! 3. I designed a bracelet for my next workshop, and actually set a date! If you’re in the area (Weston, MO) stop in to say ‘HI’ and participate! 4. 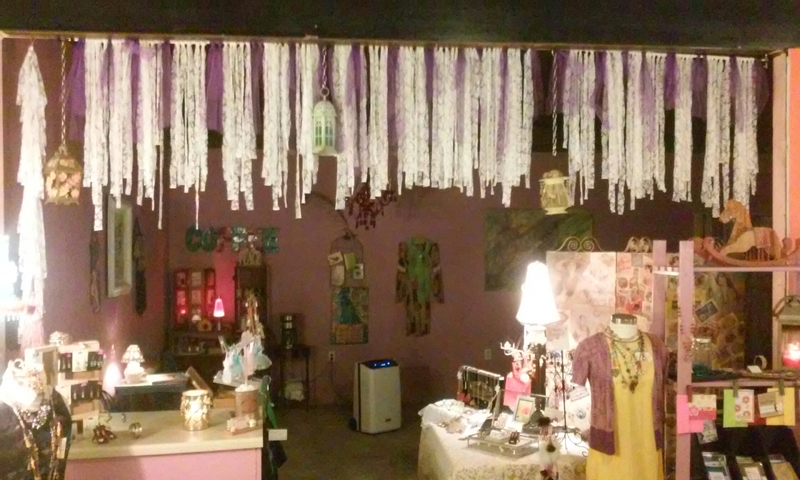 I put up a partition in the store, but the drapes look a bit … well, blah! 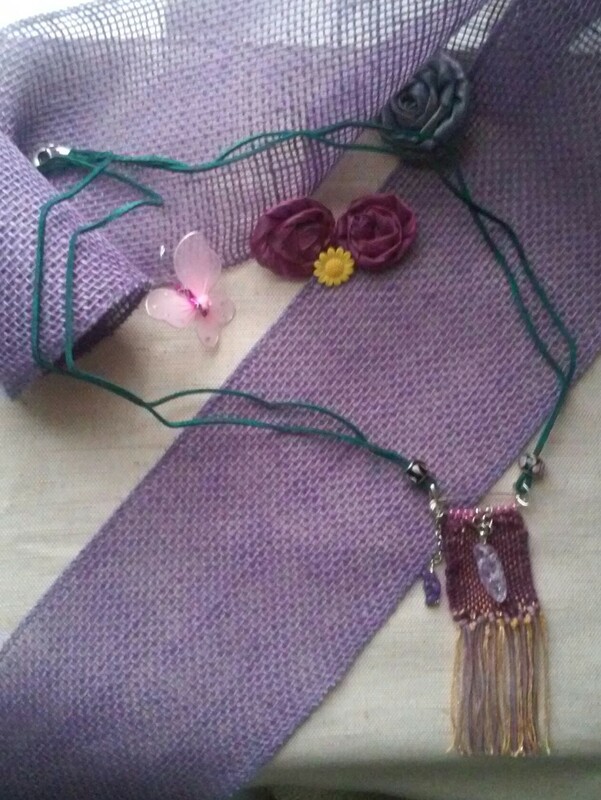 I’m planning to embellish them with various one-strand creations. 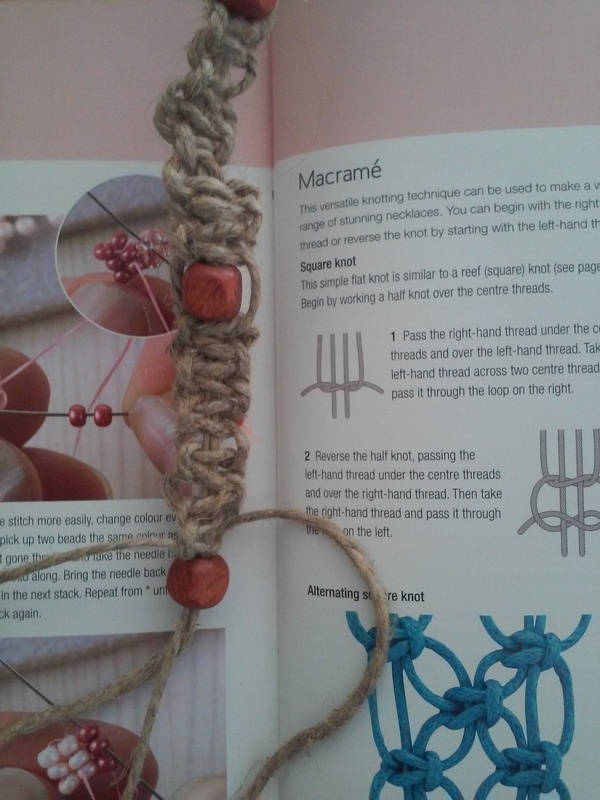 One of them is Macramé – haven’t done that in ages. I remembered seeing a how-to in one of my clever craft books. I went looking for it, found it (!!!!) 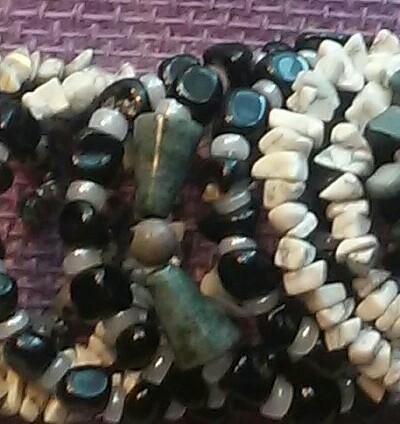 – it was a good day- , got out my hemp, and wood beads and started knotting. It actually looks like it’s supposed to…hehehe…told you it was a good day! Now I have more creations to create, plans running around in my head to be put on paper, and dusting…need to dust! 😀 So I let you go for now – please look for the next post/newsletter! As always, I’m looking forward to hearing from you! Do you know ‘Fancy Jasper’? I just finished a set of ‘Fancy Jasper’ Jewelry, and got curious about this beautiful stone. Here is what I found …. Jasper is a dense, opaque variety of Quartz. It occurs in as fillings in fissures and may be found all over the world. The most notable deposits were found in Australia, Brazil, Canada, Egypt, India, Indonesia, Kazakhstan, Madagascar, Mexico, Russia, Uruguay, Venezuela and the United States of America, including Arizona, Arkansas, California, Idaho, Missouri, Oregon, Texas and Washington. 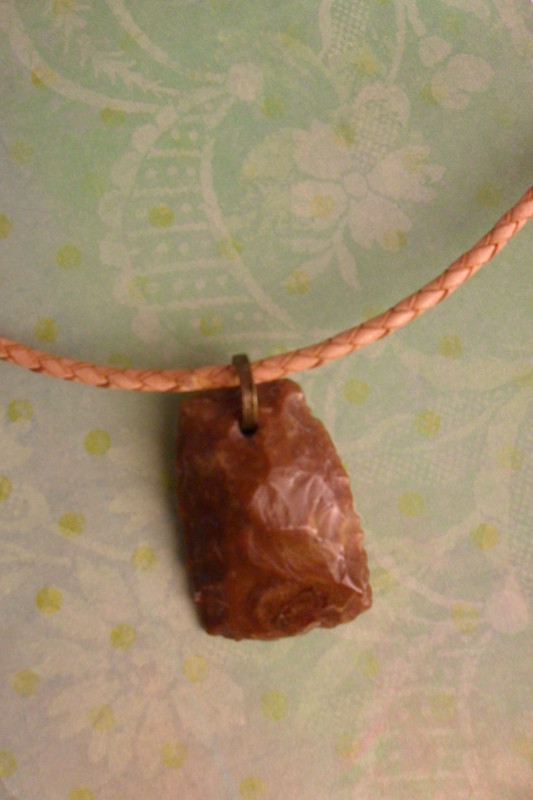 ‘Fancy Jasper’, also called ‘Rainbow Jasper’, is a steady wholesome healer , said to focus the mind and intellect. My source* tells me that it can temper procrastination and help organize an overactive mind into more linear thought, preventing one from getting caught up in worry over the past or future, and inspiring one to work through issues of the present. It is also ideal for rejuvenating one’s creative power and refining mental processes in order to work through intricate thoughts, ideas or puzzles. *crystalvaults.com ~This website and I would like you to note that the Information on this web site is no substitute for consulting a health care professional. All information contained on this web site, including information relating to medical and health conditions, products and treatments, is for informational purposes only. Mine are more subdued, because I wanted to use them in ‘unisex’ jewelry, and most guys are not too eager to wear the pinks, the purples, and orange. The stones I got are from, and hand-carved in, India. 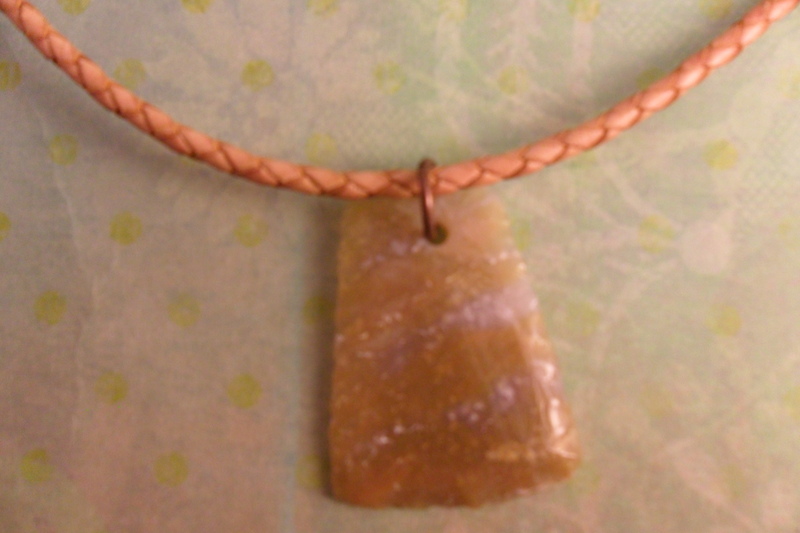 I paired each stone with a length of tan leather-braid. 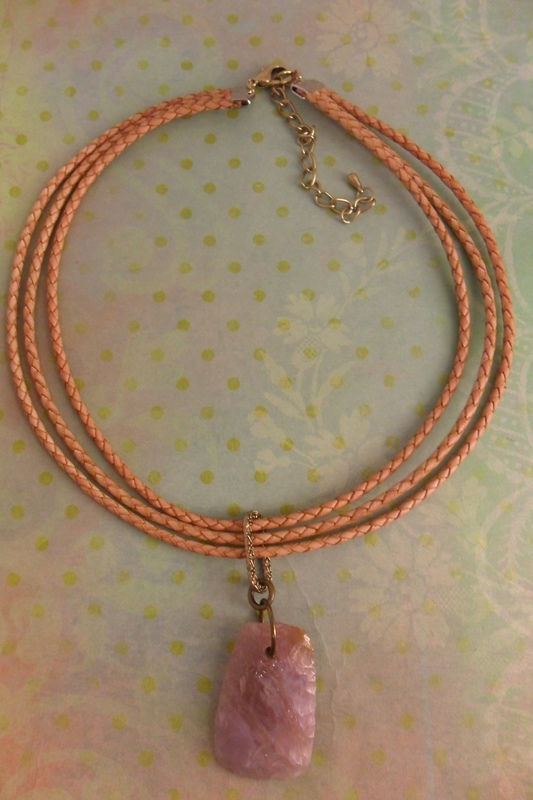 One piece is ‘just for us girls’ ~ the stone extends from a 3-strand leather-braid necklace. 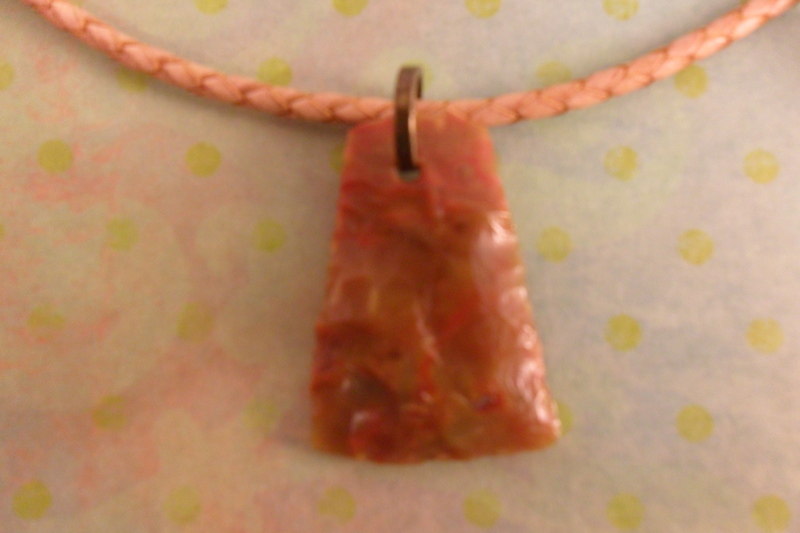 Jasper can be easily cleaned using warm, soapy water and a soft cloth or brush. Be sure to rinse it well to remove any soapy residue. Avoid wearing or storing mixed gems together, in order to prevent scratches and fractures to your gemstones and jewelry. 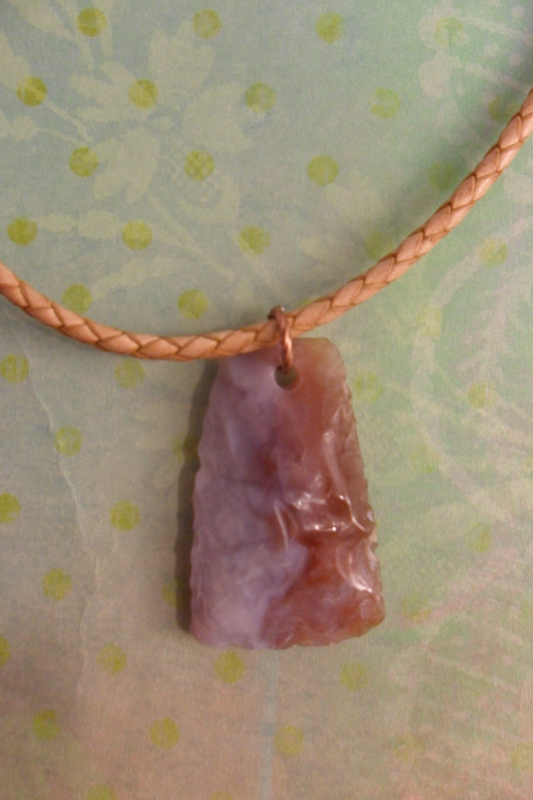 When storing jasper, wrap it in a soft cloth and always remove jewelry before exercising or playing any vigorous sports.